Spend less time cleaning and more time fishing. With the best electric fillet knife at your disposal, you’ll be making short work of cleaning and prepping fillets. When you start using electric fillet knives, you will feel the difference outrightly. It takes only minutes to separate the skin from the meat and cutting the rib. With the old traditional fillet knife, it’ll take almost an hour to do so. Doing the cleaning with a regular knife is very time-consuming. You’ll lose focus. It puts more strain in your wrist; you start filleting not to do it optimally but to get things done. In that case, if you are an angler, for example, you leave a lot of meat on the bone. I am certain that is not what you want, and an electric fillet knife will salvage that situation. What is a Filleting Knife Used For? I would much rather spend hours fishing rather than filleting fish. Doing with a normal fillet knife takes hours. This where modern technology comes in to save the day or should I say save time. Throw out your old knife and get the best fish fillet knife and let it do all the hard work. A fish fillet does what your normal fillet knife does but faster. Electric fillet does all the hard work, and you only need to hold it properly. What’s more is that you don’t even need to apply any additional force. The motor does the job for you. Some of the high-end electric fillets can even cut bones and make quick work of the bigger fishes like tuna and salmon. You can separate the flesh from the bone and even skin them to perfection. I personally prefer using the electric ones because it takes little effort and does a wonderful job. 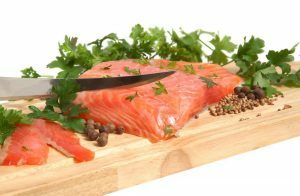 What are the benefits of using an electric fillet knife? Here are some of the top reasons why should ditch your old knife and get an electric one. A well-made fish fillet knife can smoothly clean off the skin & even cut through the meat without you having to put any force behind the knife. The rotary motor does all the cutting, and you simply need to hold a firm grip and slide the fillet. You can make your catch cook ready in just minutes. Try doing it with a regular knife afterward and see how tedious the process is. Even if you are a seasoned pro, you’ll still find the electric ones useful. Skinning a fish with a traditional knife is too time-consuming. You can’t afford to spend too much time on a single fish. Increase the amount of fish, and the whole process is a nightmare. This is where electric knives shine the brightest. It’s perfect for people with poor wrist strength. Even they can easily make short work of the skin, slide the knife between the flesh and make some delicious fillet that’s ready for the skillet. The earlier models weren’t very efficient. Due to lack of design and blade shape, most of the anglers and chefs didn’t bother with them. However, after a lot of improvements, these knives outperform the old ones. Most of the modern knife has a durable blade that can cut through the tough meat. You should keep an eye out for the stainless-steel blades. Those are very sharp and tends to maintain that sharpness for a long time. If you are a perfectionist but don’t want to end up wasting too much time cutting and skinning fish, you’ll instantly fall in love with the electric fillet knives. This small kitchen appliance automates the whole cutting or carving process. It has a typical and a pretty straightforward design. The blades are very sharp and require very little maintenance. Although you need to sharpen the blade once in a while but certainly not as much as a regular fillet knife. Speed and efficiency, these are the key selling point here. You won’t be able to show off your skills, but you’ll get the job done faster. Time is money. Some of these knives have the feature to switch out your old used blade and add e new sharp one. The angle of the blade is the same as the manual ones but motorized. Both wired and wireless option available. If you are outdoor where you don’t have access to any power cord but still want to use them, go for the cordless fillet knives. Make sure to take one with you in this trout season. There are some areas where using an electric knife makes a lot of sense. Imagine if you have to slice hundreds of fish in a day. You can’t afford to waste that much time and energy in the 21st century. Times have changed. Get yourself one of these and thank me later. You might be wondering, with all of the fancy functionalities, it must be expensive. Surprisingly, these knives don’t even cost that much. What’s more, some of them aren’t even near the price point of the mid to high-end traditional fillet knives. How come electric ones cost less? Well, some factors play a huge role here. First of all, all the traditional knives are backed by expert craftsmanship. They also have prestigious and brand value which leads to the higher price tag. A lot of procedure goes into making the blade. Which increases the overall price. But, that’s not the case with the electric knives because most of them are made by industry grade manufacturing machines. Think of the old knives as flagship smartphones. The companies can charge any amount of money they want for their flagship models. There are other perks to owning an electric fillet knife. Precision is one of them. You can easily cut to a certain degree, customize the blade to the task at hand and many more. Even the cheap ones do a good job of filleting small fish. I’ve seen a lot of people using them in the fish markets where a few decades ago they wouldn’t even think of using one. Thanks to all the improvements and the flexibility and also the fact that they cost way less, these have become increasingly popular. The below listed electric fillet knives are the best and pass the bar with some incredible results. Take your time and evaluate each of them. Later on, you can decide which one is the best for you. The king of heavy duty electric fillet Knife. This is a heavy duty knife with a heavy duty motor to ensure smooth operation. It is a corded version and has twice the speed and thrice the power of an ordinary corded/cordless fillet knife. Which is why I’ve made this one of my top choices. The blade gives you an excellent reach with the 7 1/2-inch length. For easy cleaning, the blade is dishwasher safe. The Rapala Heavy Duty Electric Fillet Knife is a guarantee for fast filleting. It requires an 110 V supply. The advanced airflow design gives you the perfect relaxed grip. The cord is 8-inch long which is more than enough for most filleting jobs. Not just fish, you can ever carve roast, ham, and turkey with this one. The best-corded fillet knife money can buy. This here is the deluxe version of their best-selling model. The improvement was a drastic one. Don’t believe me? Check out the number of positive reviews of this one. Right after fishing, if you need to do some filleting you can plug it to a boat lighter outlet and get things started.It also has a travel case made from blow molded plastic. There are two stainless steel blades, a 6" and a 7-1/2 ". The ergonomic handle design gives a relaxed grip body. You can either use the Rapala Deluxe Electric Fillet Knife from an 110 V power source or a 12 V battery power source. 7 1/2" stainless steel serrated edge blade is long enough for most of the cleaning job. Rapala uses an advanced air flow design for the knife. At 18 foot the power cord gives more than enough length. The motor is log lasting and ensures for durability. The Berkley electric fillet knife uses an 8-inch blade. Heavy duty 120 volts motor is responsible for the reciprocating motion of the stainless steel blade. The stainless steel blades are anti-corrosion and thus make for durability. Side blade release allows for easy blade changing. One of the most dangerous situations would be the trigger turning on the blade accidentally. The knife has a trigger lock for safety. Berkley uses an ergonomic handle design that gives you much comfort during filleting. The blade is extra sharp. The only thing that the manufacturer needs to change is increasing the cord length. Mister Twister FILLET COMBO EZ-ScaleR Electric Fillet Knife Combo is a knife that mister twister introduced in 1986 and an industry leader since. How much would you like a knife made by a fellow fisherman? My guess is that you would love it. That is the Mister Twister FILLET COMBO EZ-ScaleR Electric Fillet Knife Combo for you. Fishermen love it as the 120V AC powered motor runs in the range of 2800- 3200 revolutions per minute. The speed rating makes it the fastest, and we know what that translates to, faster work rate. A bonus feature is the Mister Twister new EZ-scaler. Convenience and ease of use are factors that play a great role in determining how functional the knife is. The Mister Twister FILLET COMBO EZ-ScaleR Electric Fillet Knife Combo is lightweight and has a comfortable handle that makes for ease of use. The blade is extra sharp making scaling and filleting a breeze. Also, it has a convenient blade release. If you are looking for a knife that will provide you with consistent filleting, then you just found it. Engineered to run longer, last longer and perform better than most other EFK. Running on 110 volts the motor delivers two times the torque, much better than other competitor knives. The most famous part of this knife is the blade. Powerful enough to clean even the toughest of fish species. You name it; it can cut it. The stainless-steel blade is tough yet flexible. Universal compatibility meaning you can use it on any American Angler electric fillet knives. The ergonomic handle design ensures excellent balance, so you do not suffer fatigue. Included in the knife package is a convenient carry bag. The carry bag allows for excellent aeration to prevent odor. Aeration also lets out moisture thus preventing corrosion. At 8 foot the power cord is sufficiently long. Venting and fan cooling design see to it that the electric fillet knife runs for longer. It also has a two years limited warranty. Convenient carry bag & Universal compatibility blades. This is a powerful fillet knife from Mister Twister that can cut through some big fishes with ease. With the powerful motor backing it up, you can clean hundreds of fish, ham, and turkey. To get going, all you need is a 120-volt power outlet & if you are working on your backyard, use an extension cord. It has an ergonomic handle design. Lightweight and convenient. It’s also comfortable to hold. If you are planning for long hours of filleting, go for this one. The fattest past if the handle is only 1 1/2". This knife features 7 1/2 inches of sharp and long stainless-steel blades. Trust me when I say this, these are some scary sharp blades. What’s more, you can order replacements if you want. You can also sharpen them at home if you know how. The convenient blade-release mechanism is a neat feature to have. Extra sharp and long blades. Another powerful product from Mister Twister and this time it’s the MT-1208 SW Piranha Knife. The blade is sharp like a Piranha’s teeth. This is a true saltwater fillet knife for the saltwater fisherman. You can expect the same level of performance as the previous one that I reviewed. This rugged electric fish cleaning knife is made to handle tough skins and scales of many saltwater fish. It boasts 25% more torque and 15% increased speed from its predecessor. It has a long 9" heavy duty serrated edge stainless steel blade which can cut hundreds of fish with ease. This blade can cut through 10 lb. of catfish and crappie. Slide it along the ribs and the spine and enjoy a boneless fillet. How to Choose the Best Electric Fillet Knife? Before I get to the technical stuff, here is my 2 cents on the topic. Not all the electric fillets are perfect. Almost all of them have some kind of drawbacks. If you over do it that is. Keep in mind that there are time and place for these knives and it’s not your daily kitchen knife. Hope I made my point. Get the genuine stuff, prepare to spend some extra bucks for the premium quality and always pay attention to the blade size. Handles are important too, but not as much as the blade. Also, check the specs, see how powerful the motor is because that’s the very thing that’ll power the knife up. An ergonomic handle design gives you a comfortable grip that facilitates for longer knife use without fatigue. Also, the handle should be from a non- conductive material to avoid burns from motor heating. Remember that it is an electric knife so heating and electric shock is also a possibility but an insulated handle will keep you safe. Durability stands for a whole lot of things for the electric fillet knife. From the handle to the blade and also the motor. The one question is, is all these components durable. Check from other reviewers if the motor can stand the test of time. Also, some blades fall off at the least contact with some resistance. Variable speed is a great feature to get from an electric filleting knife. Although most of them don’t have one and I highly doubt you’ll ever need this feature. It is not all the time that I often need to be in a capacity to vary the speed as per the task at hand. If you find a blade with a range of speed, that one is most likely a variable speed electric fillet knife. It’s always nice to have some extras . Most of the manufacturers make carry bags that are well ventilated to ensure excellent airflow. Good airflow keeps off bad odors and moisture. Bad odor and a corroding knife are two things that you should eliminate at all costs. In the course of filleting, I find myself in situations that require the use of knives with different lengths. Using a long knife for a task that requires a short one results in fatigue. It is important that the knife has blade release system that allows for easy blade changes. There are two types of safety here. Your safety, and the safety of the knife. The safety of the knife mostly refers to the motor. For the motor to operate safely, it is necessary that the manufacturer incorporates a handy cooling system. Such are ventilation and fans that keep the motor from overheating and possibly burning out. 1. How To Make Your Cheap Fillet Knife Scary Sharp? Sharping an electric fillet knife is probably the easiest among all other sharpening techniques. With this method that I’m about to show you, you can sharpen any serrated edge knife and don’t even have to take out the blade. All you need is a Block knife sharpener. These are American made sharpeners made specifically for electric fillet knives. It’s a hand-held device that’ll sharpen any type of serrated edge blades. Whether it’s your pocket knife, kitchen knife, scissors or garden tools, you can sharpen them all. Simply turn on the knife and roll back and forth in the middle to get the pins vibrating. The result will make your cheap fillet knife scary sharp. 2. How To Use A Fillet Knife? Before you use one, you need to make sure the blade is flexible. This will help you to get under the skin as you slide it away from the meat. I rarely use the traditional knife, because when you catch a lot of fish, let me tell you folks, the fillet knife can save you a lot of time. For starters, you would want to do three things. Remove the skin, have two fillets and then remove the rib cage. You can do all three things with a fillet knife. First of all, get the fish. Place it on top of a cutting board and start cutting right beneath the head. You don’t want to push too hard because it’s an electric knife because it will go all the way and you don’t want that. Start cutting and stop when you hit the backbone. Then once you hit the backbone, turn your knife slide the knife along the backbone and cut through the ribs. Stop right before the tail fin and repeat the process to get a boneless fillet. 3. Where To Buy American Angler Electric Fillet Knife? You can find them in your local tool shop. Do be careful though because there is a lot of cheap knockoffs. If you want to get genuine products, either go to Amazon or visit American Angler’s website. You can click the links here to find the original product. 4. How To Sharpen Electric Fillet Knife Blades? If you look at the first question, you’ll see that I’ve mentioned how you can make your electric fillet knife scary sharp. This time though I’ll mention all type of blades in general. Not just the cheap ones, but more high-end ones too. As you know by now, my personal favorite is the Block knife sharpener. It’s cheap and does a pretty decent job. But this time, I’m going take things to a whole new level. There is a product called Work Sharp Knife & Tool Sharpener made by Work Sharp. You can find them in your local tools store or get one online via Amazon. You can do regular knives, scissors, and serrated knives. It’s a multi-functional tool and works great. It’s not crazy expensive. This one tool will be your solution to every kind of blade sharpening. Just run your blade through the machine three to four time, and you’re done. It’s that easy. Although both of them looks the same, they have different purposes. Many people don’t even know the differences between them. The blade shape of the boning knife is different than the blade shape of the fillet knife. This is probably the only noticeable difference you’ll see straightway. Fillet knives have thinner blades and are way more flexible. Don’t get me wrong, the blades on the boning knife aren’t stiff but not as flexible as the blades of the fillet knives. They also have different usage. Although, a lot of people use the boning knife for meat because the blade is more durable. Fillet knife, on the other hand, should only be used on fish. That’s it, folks. Thanks for patiently reading this guide. It was a long one, and I had to because there was a lot of information and I needed to include them all. Hope you found your perfect match from my list of best electric fillet knives. These were carefully chosen not only because they are the most popular ones out there, but also for the reason that you’ll get the most bang for your buck. If you found this article helpful, Please comment and share! If you fillet a lot of items a fillet knife will save you a lot of time, stress on your body, and meat from the bone! By using an electric fillet knife you will save wrist, hand, and arm strength, making it easier and more enjoyable to fillet more items in a correct manner. You will save money because you will not leave as much meat on the skin or bone. The above listed knives are very impressive and I am sure that any of them will be a good choice when it comes to finding the right fillet knife for your needs. These knives will pay for themselves within the first few uses and I’m sure any of them will become your new favorite tool for your filleting needs. The ergonomic handle will make using your fillet knife safer and more comfortable. The durability of a knife is of top most importance and the above choices show some very durable knives for you to choose from- they will all last for a very long time when you take care of them and keep them safe in either the carrying/storage case provided, or one that you provide for this very function. Choosing a knife with variable speeds will help with different types of meat that you fillet. You can use a lower speed for more detail or a more delicate meat. An added feature to these knives are the coolers for the motors. By having a cooling system, you can be sure that your new electronic fillet knife will hold up strong for many years to come. This is a very informative guide which will help you to find the correct electronic fillet knife for your needs. Thanks so much to the author, Brian M. Casey for this time saving effort! Absolute comparison! Well thank you for sharing the differences over different online markers about the electric fillet. Knife I use at my home have variety in thickness and sharpness. Sometimes they break when still chopping some sort of meat in a board. After researching though this article, i found that tradition knife and old ones takes too much and time consuming, wasted of time actually. The article written by the experts are outstanding and clarify my mind on knife, in which i did have a little knowledge. Now i am gonna find the right one for myself. Thank you. This is a very useful, informative guide for anyone who’s looking to buy an electric fillet knife. I appreciate the effort and research you put into explaining each knife. I would personally find it hard to choose one because they all look top-notch. Each one only has one con compared to four or five pros, which speaks for the quality of the product. My dad needs a new electric fillet knife so I was going to get one for his birthday, but I really had no idea what one was best to buy. So glad I found your article, it’s helped me a lot. I think I’m gonna go all out and get him the Rapala Heavy Duty, he’s gonna love it! I feel really good to see all those products.It’s a creative invention ever.I really feel bored when I separate skin and bone from the meat.It depressed me.Now I find some hope when I see those products..I’m really excited to purchsed those product.It will save my time for doing other work.Besides, the price of those product is not so high.I really want to thanked the company for those product. I and my family are meat lovers, not only fish, we love roast ham, chicken and during Christmas time turkey. Using a conventional knife is very cumbersome, tiring and time-consuming, hence we needed an electric knife which could go well, not only with fish but also other roast meats. Also to keep in mind the price and versatility of the knife. The knife we chose was Rapala heavy duty knife, this beauty had a long cord hence the reach was sufficient, no low battery or charging fuss. The motor is powerful, no problems with any meat. The comfortable grip which made filleting a pleasure and the knife ran through the meat like a hot knife through butter with minimal meat left on the bone. The effective cooling system of the motor prevents heating and dries up moisture. Overall a fantastic knife which saves us a lot of time and fuss. Highly recommended. Hey Margaret I agree with you about Rapala Knife, it’s really giving me comfort zone when I think about filleting fish. Thanks for your wonderful feedback. I hope you liked my write up on fillet knife. I am really impressed to see the review of American Angler PRO Electric Fillet Knife. I’ve heard about this product many times, but haven’t had a chance to research more till now. Thank you.